See this #AmazonGiveaway for a chance to win: The Princess Diaries (Kindle Edition). https://giveaway.amazon.com/p/e9e4ce88f0cb151b NO PURCHASE NECESSARY. Ends the earlier of Apr 30, 2018 11:59 PM PDT, or when all prizes are claimed. See Official Rules http://amzn.to/GArules. No one won the Princess Diaries giveaway, so I’ve relisted it :). In honor of my birthday, which is this month, I’ve decided to give away some stuff :). Namely, popular books by some of my favorite YA authors (but there may be other things as well). If you’re in the US, head over to https://giveaway.amazon.com/p/e9e4ce88f0cb151b for a chance to win: The Princess Diaries (Kindle Edition). NO PURCHASE NECESSARY. Ends the earlier of Apr 30, 2018 11:59 PM PDT, or when all prizes are claimed. See Official Rules http://amzn.to/GArules. I’ll be listing other giveaways throughout the week, so check back if you’re interested. And as always, thanks so much for all of your support. It means the world! On Tuesdays I post a little about what I’ve been reading lately. 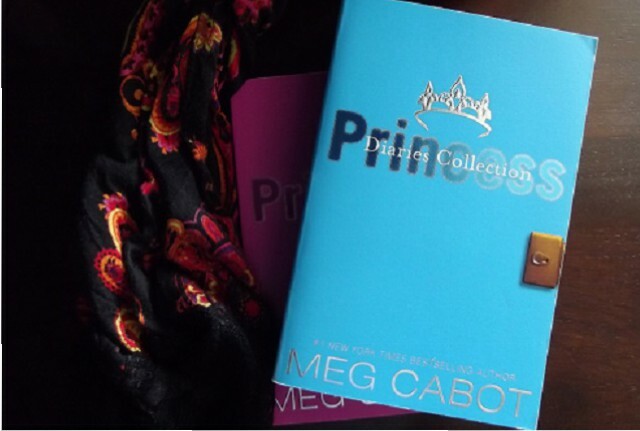 Among other things, I have lately been catching up on Meg Cabot’s Princess Diaries series, which I started reading years ago but never finished (story of my life where series are concerned, it seems). The above photo is of a collection of volumes I-III and volume IV, the the only volumes I have in physical format. I had gotten up to volume VI before I stopped. Within the past few weeks, I’ve bought the rest as e-books and have read almost all of them in anticipation of the 11th installment, Royal Wedding, coming out next month. To be honest, I am a little princess-ed out at this point. I should have spread the reading of these out a little more! But I am almost done now…and still looking forward to the new book :).